Review date: 13 May 2000. Juster's SP691 speakers have a USB cable coming out of them, and they only cost $AU25 - about $US15. This makes them a breakthrough in the USB speaker market, right? Well, wrong, actually. Because they're not USB speakers. This is going to take a small amount of explaining. Universal Serial Bus (USB) is that nifty connection standard for low to medium bandwidth devices that's been built into PCs and Macs for a while now, and which can be added to older machines by sticking in a cheap root hub card (like the one I review here). USB's normally used for things like mouses and keyboards and scanners and printers and modems, and it works really well. You plug the device in, you install the driver, you probably don't even reboot; hey presto, new peripheral. While the computer's on, you can disconnect and reconnect USB devices as you like. Need more USB ports? Plug another hub into one of your existing ports. But USB can also be used for audio. It's got enough bandwidth for it. You just plug some device, like a pair of speakers or a little dingus with a speaker/headphone connection socket on it (I review one here), into a USB port, and install the driver (Windows even has drivers built in, now, for standard gear like this). Bingo, one audio adaptor. The computer doesn't need a sound card, but everything works as if it had one. You can even play audio CDs, if you've got a modern CD-ROM drive that can do Digital Audio Extraction (DAE). USB audio devices are a bit expensive, and they use a bit more CPU time than a plain sound card would. But as a plug-and-go way to add sound to soundless computers, they're handy. Well, this pair of speakers is nothing of the sort. They've got a USB cable, but they've also got a perfectly conventional audio input cable that terminates in the usual 1/8th inch stereo plug. 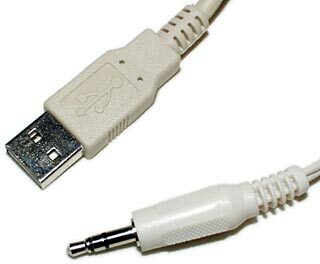 Plug the USB cable into a free USB port and the computer doesn't notice that anything's happened at all - normally, plugging in a new USB device will automatically start the setup process. All that changes this time, though, is that you can now turn on the speakers. The only wires that are actually connected from that USB cable are the power and ground ones (you can see them in this picture - they're the red and black ones). No data wires are used. Basically, these speakers just use the PC as a mains adaptor. This explains why the other version of the SP-691s that Juster makes, which uses mains power, costs the same. If you've got a spare power point, there's no reason not to the mains version. But a lot of people have quite enough power cord macrame going on behind their computers already, thank you very much. A simpler connection for the speakers doesn't hurt. Apart from the odd power supply arrangement, these speakers are quite unremarkable. As you'd expect, for the money. They're magnetically shielded, so you can use them right next to a monitor without distorting the image. There's a headphone jack on the front of the speaker with the amp hardware in it, so you don't have to fish around behind your PC if you want to personalise your audio. Plug something into the headphone jack and you mute the speakers, as you'd expect. The cables aren't very long; the USB and input leads are a metre in length, and the between-speakers wire is only 80 centimetres. You can get extension cables for the first two; the last one's only easy to extend if you know how to solder. Part of the reason why the Justers cost so little is that they only work when they're powered. 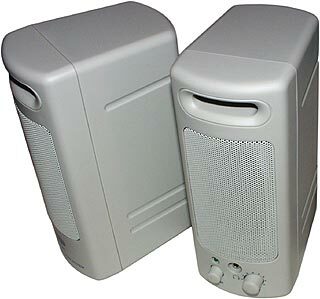 A lot of dinky powered speakers can also work as ordinary passive speakers, powered by the amplifier on most sound cards, when their own amplifier's not turned on. If your sound card's got a "SPK OUT" connector in addition to, or instead of, a "LINE OUT" connector, then it's got an onboard amp and can run passive speakers. Sound card amplifiers are usually good for a couple of watts per channel. This is quite loud enough for desktop applications, because auditory response is logarithmic. 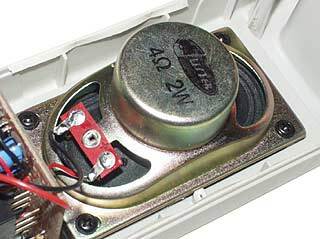 Two watts sounds about half as loud as 20 watts, which in turn sounds about half as loud as 200 watts, assuming equal speaker efficiency. Speaking of power, small speaker manufacturers love to. And they all lie like crazy. The box for the 691s says "Power Output 120 Watts" on the side. This is using the mystic "Peak Music Power Output" (PMPO) scale, which, in essence, means "make up a big number". It's got nothing to do with the real power handling of the speakers. See the "2W" on that little 1.5 by three inch driver? That tells you that putting 120 real watts into these drivers would, practically instantly, burn out the voice coils. The Justers are actually powered by an STMicroelectronics TDA2822M amplifier chip. From a five volt input, is good for maybe half a watt per channel. This, by the way, makes it unlikely to overstrain the USB power supply. From any port on a powered USB hub, you can draw up to 500 milliamps at 5 volts. This gives two and a half watts to play with; the peak draw of the SP-691s probably won't exceed two watts. If two half-watt channels equal "120W PMPO", I'm happy to say that the amplifier in my big stereo is, by the same measurement, good for about 24 kilowatts. And I am seven hundred feet tall. Because half a watt ain't much, and because minuscule 1.5-by-3 inch drivers aren't very efficient, the Justers are not very loud speakers at all. Your ISO Standard Dodgy Computer Speakers, with a three inch round driver and running from a two watt sound card amp, can be turned up loud enough to attract complaints from the person at the next desk. The Justers cannot. Their peak volume isn't high enough to prevent conversation, at normal distances. This may be a problem for you; it may not. Let's face it, if you want a disco experience, don't buy baby speakers. But the SP-691s really are pretty darn quiet. If you're a game player, you're not going to like them. Save up for a three piece speaker set (two little satellite speakers, one bigger subwoofer); it'll make you much happier. I review four of these, also made by Juster, here. You can get quite acceptable three-piece sets for less than $AU100. It's possible to get substantially better sound than the Justers deliver, but only for more than three times the price. When "more than three times the price" is only $AU85 or so, though, it's not that frightening a prospect. Many places sell speakers that are worse than this for quite a bit more money - the things people pay $AU50 for are often really quite awful. But the SP-691s, despite their low price, still aren't especially good value. Then again, if you know what you're buying and really don't need anything more than a nice clear Windows "ding" noise every now and then, or you want some teeny cheap speakers you can cram in your LAN party bits-bag and not worry about if you happen to leave them at the venue, these are a good choice. They sound OK, for the money. Aus PC Market don't sell these speakers any more, but they've got lots of others! US shoppers should check out the speaker section on DealTime.